11/30/2018 - In a sight that truly must be seen in person, thousands and thousands of stuffed animals will come raining down on Sunday evening in Hershey, Pennsylvania. 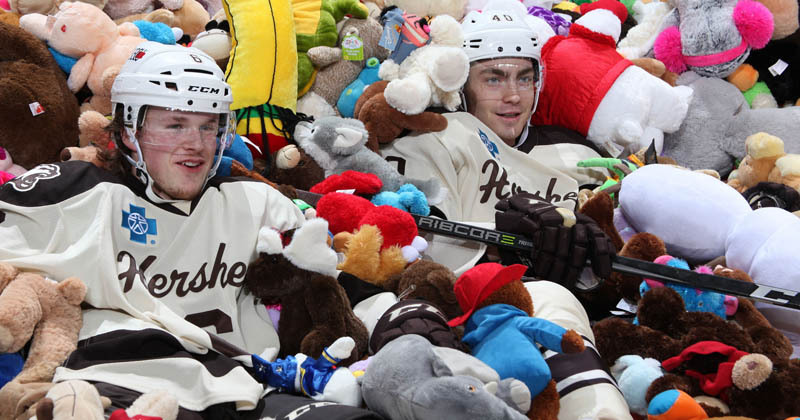 The Hershey Bears, the oldest and most decorated team in the American Hockey League, will attempt to break a world record on Sunday, Dec. 2 at the team's annual CommunityAid and WGAL Teddy Bear Toss. The world-famous event sees fans throw stuffed animals onto the ice following the team's first goal of the game. The stuffed animals are then collected and donated to charity ahead of the holiday season. Last season, the Bears collected a team-record of 25,017 stuffed animals in the event. This year, the team is looking to surpass the world record of 28,815, posted by the Western Hockey League's Calgary Hitmen in 2015. New or gently used stuffed animals of all kinds are accepted. Local partner CommunityAid will make a donation of 25 cents per stuffed animal collected to benefit the Children's Miracle Network. If the Bears surpass the world record of 28,815, CommunityAid will donate 50 cents per stuffed animal, up to $15,000. Additionally, a club seat holder for the Bears will donate $1 per stuffed animal collected on behalf of the Sweigart Family Foundation. The teddy bears and stuffed animals are collected and donated to nearly 30 local organizations including schools, food banks, churches, as well as Children's Miracle Network and the American Cancer Society. Tickets are going quickly for Sunday's game. Score yours HERE!